Thus, the ecliptic longitude of the moon at 00:00 UT on May 5, 2005 CE was 3AR05. Thus, the ecliptic longitude of the moon at 00:00 UT on December 25, 1800 CE was 25AR57. Figure 23: The orbit of the moon about the earth. 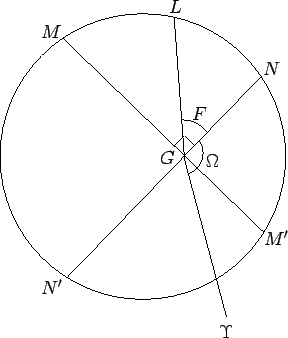 Here, , , , , , , and represent the earth, moon, ascending node, descending node, longitude of the ascending node, argument of latitude, and vernal equinox, respectively. View is from northern ecliptic pole. The moon orbits counterclockwise.